Pacific Pilchard from Acana is a dry food containing fish as the only protein source. That makes this food suitable for dogs with a food allergy or intolerance as well. 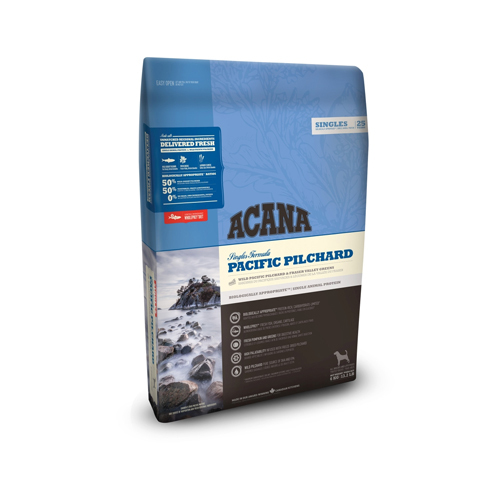 Acana Singles Pacific Pilchard is suitable for dogs of all breeds and ages. Acana Singles are produced with a single source of protein, supplemented with a small amount of fruit, vegetables and herbs. In addition, the Singles mainly consist of nutrients that are naturally available in the ingredients. The artificial additives are reduced to a minimum. Pacific Pilchard consists for 50% of fresh sardines. Fish is full of Omega 3 fatty acids, which contribute to a healthy skin and coat in your dog. In addition, these fatty acids support the immune system, the condition of the body, digestion and joints. Fresh whole sardines (25%), dried whole sardines (18%), whole green peas, whole red lentils, whole chickpeas, sardine oil (7%), fresh kale (1.5%), fresh spinach (1.5%), fresh turnips (1%), cold-pressed sunflower oil, lentil fibres, whole green lentils, whole yellow peas, fresh butternut squash, fresh pumpkin, dried brown seaweed, freeze-dried sardine liver (0.1%), fresh cranberries, fresh blueberries, chicory root, turmeric, milk thistle, burdock root, lavender, marsh mallow root, rosehips. Have you used Acana Singles Pacific Pilchard Dog before? Let us know what you think about this product.